Silver Spring is an unincorporated community and census-designated place located inside the Capital Beltway in Montgomery County, Maryland, United States. It had a population of 76,716 according to 2013 estimates by the United States Census Bureau, making it the fourth most populous place in Maryland, after Baltimore, Columbia, and Germantown, and the second largest in Montgomery County after Germantown. Inner Silver Spring consists of the following neighborhoods: Downtown Silver Spring, East Silver Spring, Woodside, North Woodside, Woodside Park, North Hills Sligo Park, Long Branch, Montgomery Knolls, Franklin Knolls, Indian Spring Terrace, Indian Spring Village, Clifton Park Village, New Hampshire Estates, Oakview, and Woodmoor. Outer Silver Spring consist of the following neighborhoods: Four Corners, Wheaton, Glenmont, Forest Glen, Aspen Hill, Hillandale, White Oak, Colesville, Colesville Park, Cloverly, Calverton, Briggs Chaney, Greencastle, Northwood Park, Sunset Terrace, Fairland, Lyttonsville, and Kemp Mill. 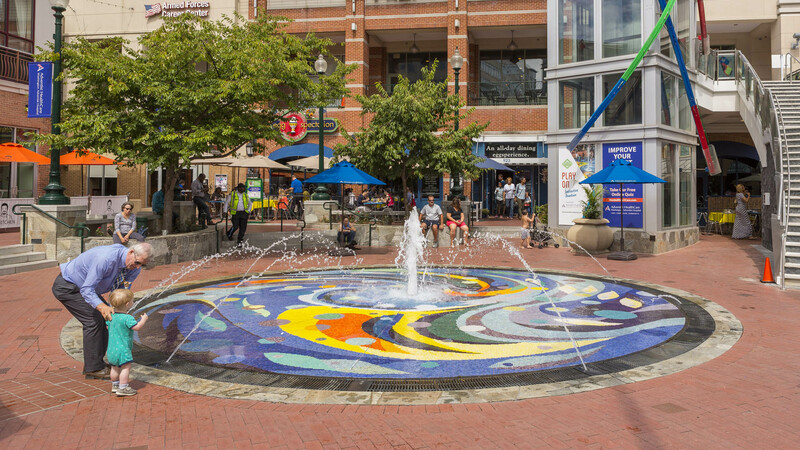 The urbanized, oldest, and southernmost part of Silver Spring is a major business hub that lies at the north apex of Washington, D.C. As of 2004, the Central Business District (CBD) held 7,254,729 square feet of office space, 5216 dwelling units and 17.6 acres of parkland. The population density of this CBD area of Silver Spring was 15,600 per square mile all within 360 acres and approximately 2.5 square miles in the CBD/downtown area. The community has recently undergone a significant renaissance, with the addition of major retail, residential, and office developments. Silver Spring takes its name from a mica-flecked spring discovered there in 1840 by Francis Preston Blair, who subsequently bought much of the surrounding land. Acorn Park, tucked away in an area of south Silver Spring away from the main downtown area, is believed to be the site of the original spring. Rock Creek Park passes along the west side of Silver Spring, and offers hiking trails, picnic grounds, and bicycling on weekends, when its main road, Beach Drive, is mostly closed to motor vehicles. Sligo Creek Park follows Sligo Creek through Silver Spring; it offers hiking trails, tennis courts, playgrounds and bicycling. The latter is facilitated on weekends, when parts of Sligo Creek Parkway are closed to automobiles. The bike trails are winding and slower than most in the region. Recently, rocks have been spread along either side of the road, providing a hazardous bike ride, or skating leisure. Acorn Park in the downtown area of Silver Spring is believed to be the site of the eponymous “silver spring”. The 14.5-acre Jesup Blair Park was recently renovated and features a soccer field, tennis courts, basketball courts, and picnic area.